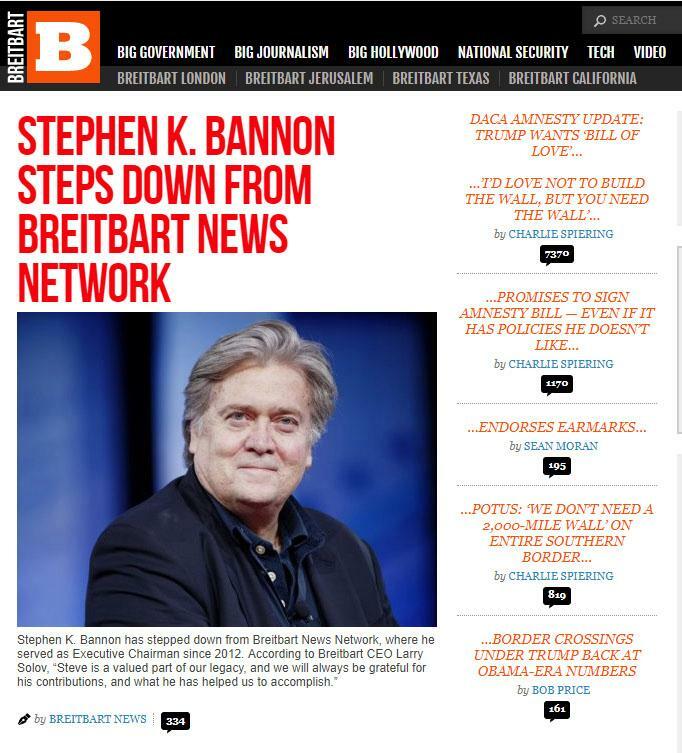 Just days after President Trump snubbed an olive branch offered by his former chief strategist and putative "alter-ego", the New York Times is reporting that Steve Bannon - the "alt-right" icon and former Trump campaign manager - is stepping down from his position as executive chairman of Breitbart News. Trump blasted Bannon in a public statement last week, saying the former senior White House official and - briefly - member of the National Security Council - "lost his mind" after Trump fired him. Bannon and the president had an abrupt falling out last week after excerpts from Michael Wolff's controversial book "Fire And Fury" - his account of the first year of the Trump administration - revealed Bannon making several embarrassing on-the-record statements. In one, he said Don. Jr.'s decision to organize the Russia meeting was "treasonous", and that President Trump definitely knew about the meeting. In another, he reportedly told Wolff that the possibility of removing Trump via the 25th amendment is discussed daily in the West Wing. Steve is a great guy but he dug his own grave ....what else can I say. According to the Times, Bannon's departure was forced by Robert Mercer, a one-time patron who distanced himself from Bannon and abruptly retracted his financial backing (including dropping payment for Bannon's security detail) because of a detail in Wolff's book whereby Bannon told friends that the Mercers would back him if he decided to challenge President Trump in 2020. In a statement, Bannon said he was "proud of what the Breitbart team has accomplished in so short a period of time in building out a world-class platform," he said. He added that he would work with Solov to ensure a smooth transition. Bannon's departure, as the Times makes clear, is the culmination of Bannon's rapid denouement. He was little-known outside of conservative circles before taking the reins of the shambolic Trump campaign two-and-a-half months before election day. When he first at the White House, he represented a power center and rival of Chief of Staff Reince Preibus. Bannon, like Preibus and several other senior West Wing aides, had so-called "walk-in privileges with the Oval Office. He also reported directly to Trump. Trump has reportedly been making calls, asking all of his friends and political allies to turn their backs on Bannon. For his part, Bannon took to Breitbart radio earlier this week to publicly affirm his support for the president. Even though the two men publicly feuded this year following his firing - most notably over Bannon's early support for former Republican senate candidate Roy Moore - Bannon has persistently proclaimed in public that Americans should "thank God" that Trump is president. For Bannon, it was too little too late.